University of Illinois chemistry professor Alexander Scheeline developed a cell-phone spectrometer for high school chemistry classes. He wrote free software that analyzes JPEG images taken by students' cellular phones. CHAMPAIGN, Ill. - University of Illinois chemistry professor Alexander Scheeline wants to see high school students using their cell phones in class. Not for texting or surfing the Web, but as an analytical chemistry instrument. A few basic, inexpensive components and a cellular phone are all high school students need to build a spectrometer, a widely used analytical chemistry instrument. Scheeline developed a method using a few basic, inexpensive supplies and a digital camera to build a spectrometer, an important basic chemistry instrument. Spectrophotometry is one of the most widely used means for identifying and quantifying materials in both physical and biological sciences. "If we want to measure the amount of protein in meat, or water in grain, or iron in blood, it's done by spectrophotometry," Scheeline said. Many schools have a very limited budget for instruments and supplies, making spectrometers cost-prohibitive for science classrooms. Even when a device is available, students fail to learn the analytical chemistry principles inherent in the instrument because most commercially available devices are enclosed boxes. Students simply insert samples and record the numbers the box outputs without learning the context or thinking critically about the process. "Science is basically about using your senses to see things - it's just that we've got so much technology that now it's all hidden," Scheeline said. "The student gets the impression that a measurement is something that goes on inside a box and it's completely inaccessible, not understandable - the purview of expert engineers," he said. "That's not what you want them to learn. In order to get across the idea, 'I can do it, and I can see it, and I can understand it,' they've go to build the instrument themselves. " So Scheeline set out to build a basic spectrometer that was not only simple and inexpensive but also open so that students could see its workings and play with its components, encouraging critical-thinking and problem-solving skills. It wouldn't have to be the most sensitive or accurate instrument - in fact, he hoped that obvious shortcomings of the device would reinforce students' understanding of its workings. "If you're trying to teach someone an instrument's limitations, it's a lot easier to teach them when they're blatant than when they're subtle. Everything goes wrong out in the open," he said. In a spectrometer, white light shines through a sample solution. The solution absorbs certain wavelengths of light. A diffraction grating then spreads the light into its color spectrum like a prism. Analyzing that spectrum can tell chemists about the properties of the sample. For a light source, Scheeline used a single light-emitting diode (LED) powered by a 3-volt battery, the kind used in key fobs to remotely unlock a car. Diffraction gratings and cuvettes, the small, clear repositories to hold sample solutions, are readily available from scientific supply companies for a few cents each. The entire setup cost less than $3. The limiting factor seemed to be in the light sensor, or photodetector, to capture the spectrum for analysis. "All of a sudden this light bulb went off in my head: a photodetector that everybody already has! Almost everybody has a cell phone, and almost all phones have a camera," Scheeline said. "I realized, if you can get the picture into the computer, it's only software that keeps you from building a cheap spectrophotometer." To remove that obstacle, he wrote a software program to analyze spectra captured in JPEG photo files and made it freely accessible online, along with its source code and instructions to students and teachers for assembling and using the cell-phone spectrometer. It can be accessed through the Analytical Sciences Digital Library. 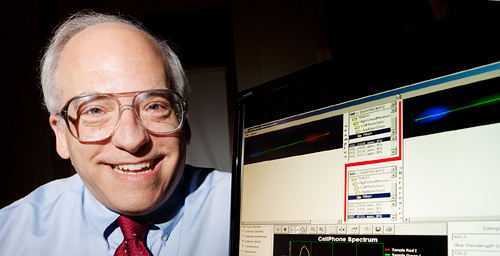 Scheeline has used his cell-phone spectrometers in several classroom settings. His first classroom trial was with students in Hanoi, Vietnam, as part of a 2009 exchange teaching program Scheeline and several other U. of I. chemistry professors participated in. Although the students had no prior instrumentation experience, they greeted the cell-phone spectrometers with enthusiasm. 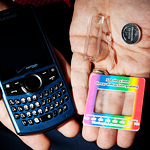 In the United States, Scheeline used cell-phone spectrometers in an Atlanta high school science program in the summers of 2009 and 2010. By the end of the 45-minute class, Scheeline was delighted to find students grasping chemistry concepts that seemed to elude students in similar programs using only textbooks. For example, one student inquired about the camera's sensitivity to light in the room and how that might affect its ability to read the spectrum. "And I said, 'You've discovered a problem inherent in all spectrometers: stray light.' I have been struggling ever since I started teaching to get across to university students the concept of stray light and what a problem it is, and here was a high school kid who picked it right up because it was in front of her face!" Scheeline said. Scheeline has also shared his low-cost instrument with those most likely to benefit: high school teachers. Teachers participating in the U. of I. EnLiST program, a two-week summer workshop for high school chemistry and physics teachers in Illinois, built and played with cell-phone spectrometers during the 2009 and 2010 sessions. Those teachers now bring their experience - and assembly instructions - to their classrooms. Scheeline wrote a detailed account of the cell-phone spectrometer and its potential for chemistry education in an article published in the journal Applied Spectroscopy. He hopes that the free availability of the educational modules and software source code will inspire programmers to develop smart-phone applications so that the analyses can be performed in-phone, eliminating the need to transfer photo files to a computer and turning cell phones into invaluable classroom tools. "The potential is here to make analytical chemistry a subject for the masses rather than something that is only done by specialists," Scheeline said. "There's no doubt that getting the cost of equipment down to the point where more people can afford them in the education system is a boon for everybody." Editor's note: To contact Alexander Scheeline, call 217-333-2999; e-mail scheelin@illinois.edu.